except that people have been brain washed into believing that electric-hybrids and pure battery motors ARE THE FUTURE and all other contenders are folly. 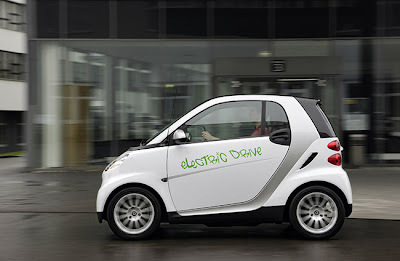 they have been brain washed into believing that electric cars are extremely green, and use no fuel. they forget that the electricity has to come from SOMEWHERE, and that in the US that is usually from coal. which makes even more carbon than gasoline, and is in even shorter supply. so Americans are hooked on electric cars and are likely to remain so for a long time, even though they make no sense at all. and anyone who thinks that the Tesla vehicle and the GM "Volt" are marketing to the same demographic needs to go back to business school. unless Porsche or BMW decide to create an EV (which they aren't going to), there will be no direct competition for Tesla anytime soon. not that i think Tesla is sustainable. it isn't. but the reasons aren't nearly as simple as "growing competition" or "cheaper batteries". basically it boils down to "how many $100,000 electric sports cars can you really sell in a year, and how can you really make enough profit from those to sustain an entire company?" which is a much harder question to answer and requires examining companies like Lamborghini, Ferrari, Fiat, Bentley, &c. almost all of which, with the exception of Ferrari, have failed to turn a profit over time. and Ferrari only does so because of the overwhelming dominance of its racing division which generates massive brand recognition, loyalty, demand and, in the end, profit, due to sale of racing parts and the entire artificial economy of its racing division. Tesla will fail. but it will not be because of the "Volt" nor, unfortunately, because Americans will suddenly discover sequential turbo powered, small displacement diesel engines running off centrifuged algae (which is where our car market -should- be going, but isn't). Thank you so much for sharing with us.. very well appreciated!